There are people who strongly believe that even though restructuring is Nigeria’s only hope of achieving lasting peace, sustainable growth and development, it is almost impossible to restructure Nigeria because of the unfounded fears of some interests over restructuring. These people believe that the only reason those who have a phobia for restructuring will succumb to its implementation is if they see that Nigeria is on the brink of a break-up. And such people seem to be right, because even though the restructuring debate has been on since the 1990s, after the annulment of the June 12, 1993 election, it gathered unprecedented momentum this year when the campaign by the Indigenous People of Biafra for the exit of some parts of Nigeria was at its peak. While the IPOB leader, Mr Nnamdi Kanu, was in detention (and even after he was granted bail), the campaign for the exit of Biafra was strong especially in the South-East and some parts of South-South. Even many who disagreed with Kanu’s modus operandi and vitriolic saw a silver lining in his campaign. For the first time since Nigeria’s independence in 1960, Nigerians were talking seriously about their continued existence as a nation. Several groups sprang up from different parts of Nigeria claiming to have an intention to break away from Nigeria, even though some of them sprang up to prove that Kanu and his IPOB did not have any control over their own part of Nigeria. The campaign by Kanu so much infuriated some people that some people, under the aegis of Arewa Youths Coalition, issued an ultimatum to all Igbo people in the North to leave the North before October 1, 2018. Some other groups from the North-Central issued their own press releases, distancing themselves from the ultimatum, and telling the Igbo people in their midst that they were welcome. There was tension in the country. Some people feared that there would be crisis in Nigeria, given the way things were going. Consequently, it seemed that the middle ground that would deflate the calls for secession and the imminent crisis was restructuring. Prominent figures from different parts of the country, including former military dictator, Gen. Ibrahim Babangida, added their voices to the call for restructuring. Members of the two tiers of the National Assembly began to make comments about restructuring and how it could be achieved or not. On September 7, Yoruba leaders held a summit in Ibadan, issuing what was known as the Ibadan Declaration in support of restructuring. Delegates from the South-East and the South-South were at the venue of the summit to witness the event and lend their support. All the meetings held with Kanu by some groups and individuals to drop his campaign for self-determination fell on deaf ears. All the entreaties to President Muhammadu Buhari to run a more inclusive government as well as adopt a softer approach on the pro-Biafran agitations also fell on deaf ears. All entreaties to the President to also show some interest in the report of the 2014 National Conference also fell on deaf ears. There were fears that a crisis was imminent. For different groups and individuals the approach was rather than watch Nigeria break up, let Nigeria be restructured to allow the states or regions more autonomy to manage their affairs. However, in September, the Nigerian Army embarked on what it called Operation Python Dance II in the South-East. 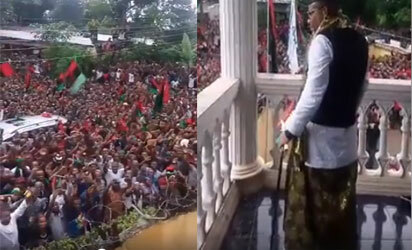 The military invaded the home of Kanu in Umuahia, Abia State, with some people killed. Since then, Kanu has not been seen or heard from. There have been arguments over his whereabouts. Was he killed during that attack by the military? Was he arrested and kept in a secret place? Did he escape? If he is alive, where is he and why hasn’t he uttered a word since then? Since that mysterious disappearance of Kanu, the IPOB campaign for referendum to determine if Biafra should remain in Nigeria or not has lost steam. The direct consequence is that the debate on restructuring Nigeria has also lost steam. Today, restructuring is only mentioned in whispers and whimpers. Shettima has every reason to regain his arrogance. He knows that as long as there is no threat to Nigeria’s seeming indivisibility, those talking about restructuring can only talk as they have been talking for decades without any result. Admittedly, Kanu spoke and acted without much tact. Many people did not look beyond his words and actions. They were consumed with their distaste of him and his campaign. They wanted him to be crushed by any means possible. They did not realise that crushing Kanu was akin to crushing their own bargaining chip. It was like one cutting one’s nose to spite one’s face or throwing away the baby with the bath water. But there were those who looked beyond Kanu’s words and actions. They saw that his campaign presented an opportunity for Nigeria to free itself from the shackles of inertia, stagnation, poverty and bloodshed. They forgave Kanu for his caustic words and taunts and focused on what could be achieved with the opportunity he had provided. They saw clearly that unlike in the past many people who were dismissive on the need to discuss the conditions of coexisting in Nigeria had lost their arrogance and recalcitrance and were open for a discussion because of the threat posed to Nigeria’s unity by Kanu and IPOB. Therefore, Nigeria lost an opportunity with the disappearance of Kanu and the silencing of his campaign. With the disappearance of Kanu, all talks about restructuring have also virtually disappeared. There is no pressure anymore on those who vehemently oppose restructuring. They have returned to their refrain that all Nigeria needs is good governance. If you ask them why Nigeria has not had good governance since independence, they will come up with another reason. Their strategy is that restructuring of Nigeria should never be allowed because it will not favour them, which is a fallacy that has no basis in Nigeria’s history. The achievements recorded by the three regions of Nigeria before 1963 attest to the fact that Nigerians lived a better and happier life when there was devolution of powers to the regions and the attendant competitiveness and creativity it engendered. Nigeria has been on a steady descent since 1966 when the asphyxiating centralisation of governance started. And there is no sign that it will get better, no matter who is the President, unless something drastic is done to its structure. Hoping or praying that Nigeria will get better in spite of its present structure is wishful thinking.